Overview — Beautiful and elegant are not words often associated with sharks, but they seem appropriate for the sleek blue shark. Its streamlined, indigo-blue body seems to move effortlessly from the surface to the deep sea that it favors. Its large pectoral fin and other appendages help with navigation, but its secret to buoyancy is a giant, oil-filled liver. This makes it easier for the shark to travel incredibly long distances. One tagged blue shark traveled from New York to Brazil, a distance of over 3,740 miles. Feeding Habits — Blue sharks eat until they almost burst. Researchers have observed groups of the sharks approach schools of anchovies. They may feed enthusiastically and then later regurgitate before starting to eat once again. Their drive to feast seems insatiable. In addition to anchovies, they also often consume mackerel, sardines, birds, seals, turtles and squid. 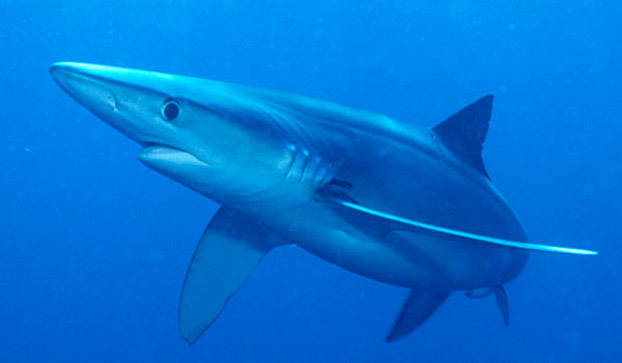 Gill rakers located on the blue shark's gills help to prevent the slippery squid from escaping. The shark's quest for food sometimes compels it to dive to depths up to 1,500 feet or more for extended periods of time. Cool Fact — Blue sharks mature quickly, with males and females becoming sexually active at around 5 years of age.